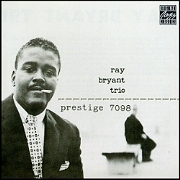 Ray Bryant, piano; Ike Isaacs, bass; Specs Wright, drums. In 1957, Ray Bryant joined with bassist Ike Isaacs and drummer Specs Wright to form the accompanying unit for Carmen McRae and this is the trio which is heard in the eight selections here. There is a variety of material in this set equally good for serious listening or just to relax with. There are modern jazz originals of merit such as "Daahoud" by Clifford Brown, "Sonar" by Gerry Wiggins and Kenny Clarke and "Splittin'" by Bryant himself. Those of you who thought you could never enjoy John Lewis's "Django" unless it was rendered by the MJQ will be pleasantly surprised by Ray's rhapsodic version. Ray's "Changes," first heard in the Miles Davis album Quintet/Sextet (Prestige) is as sadly beautiful as ever under the composer's personal guidance. The standards are handled flawlessly and Ray has also shown excellent taste in their selection. "Angel Eyes" and "The Thrill Is Gone" have not been done too often and "Golden Earrings," a minor key pop of the late Forties was never treated as well before.